So Coded is one of those rare conferences that manage to fuse great talks with a beautiful setting and much love and attention to detail. The talks ranged from how to let go of things and live in a bus for a year, to postgres wizardry. Together with Jan Krutisch and performing as wallpo.st, the after-party was ours. Many thanks going out to the team for having us, and a special hat tip to Chris 'Gizmo' Mütze for the awesome video wizardry! With a big thank you to the wonderful people at the Alberobello Light Festival – and a special hat tip to Matthew Watkins –, here's the video from our 3-night gig in the very south of Italy. Seline Redux has just been (re-)released. 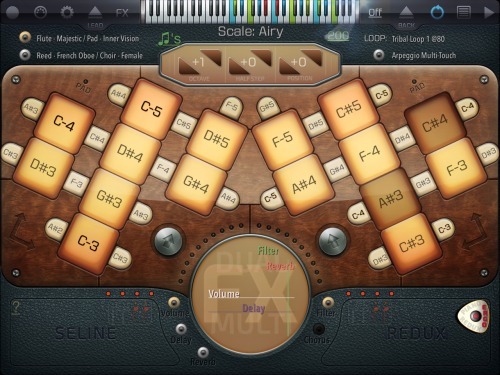 The sound app keeps all the delightful properties of Seline Ultimate, and adds a few clever enhancements. First and foremost Seline has a unique keyboard layout; assign a scale and you get carried away with long improvisations. Seline comes with a number of instruments. My favorite still is the Majestic Flute with lots of echo (delay) in a large concert hall (reverb). The sound reminds me of a live concert with Al Di Meola. His percussionist came back after the break and played an incredible duet with himself (echo&delay) whistling on beer bottles! When I found out I can hook my Pico Projector to my battery booster pack, I started doing pico tagtool projections again. Basically projected onto anything I could find. Enjoyable.